The Guda Lake is in the vicinity of Bishnoi villages (Guda Bishnoiyan, Kakani and Khejarli). The Bishnois are nature-worshippers. Khejarli village is known for 363 men and women who sacrificed their lives to protect the green trees. The Guda Lake site attracts several species of migratory birds that come here to breed. Antelopes and black bucks from the nearby forest come to drink the lake's waters. Other wild-life here includes Black bucks that are worshipped by the Bishnois, chinkaras, blue bulls, Desert foxes, hares and partridges. Camel and jeep safaris and camel-cart rides are easily available. Guda Lake is an artificial lake providing an oasis in the desert. It is situated 25 km from Jodhpur city centre. 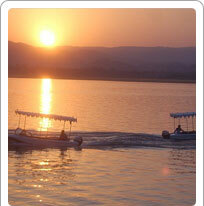 Guda Lake is an excellent place to enjoy scenic beauty and the desert wildlife.